Booking must be done by PAL Reservations, Ticket Offices, and the Mabuhay Miles Service Center only. Valid for Sales/Ticketing at the Mabuhay Miles Service Center, PAL Reservations, (booking and over-the-phone redemption) and at any PAL Ticket office (system-wide). Combination of classes of service is allowed. GMMG award tickets may be redeemed one-way or round trip for Domestic and International routes. Open-jaw award tickets are allowed for sectors with the same redemption value. Combination of GMMG and Regular Award segments in a single ticket is not allowed. A separate ticket must be issued. Ticketing Deadline: 2359H of the following day from the time of booking, except on the last day of sales/ticketing period on January 27, 2017, deadline of which shall be on 2359H of the same day. All times quoted are in Philippine time. Open-dated GMMG award tickets are not allowed. GMMG award tickets must have a confirmed booking on all sectors and segments. Rebooking is allowed with a fee. Standard rebooking handling shall apply. Any rebooking beyond the sales/ticketing period shall no longer be accepted. Must not be combined with any Service Class Upgrade (SCU), Upgrade Travel Certificates (UTC), involuntary upgrade to avert denied boarding situations, Special Airport Concessions (SAC), and myPAL Upgrade. GMMG award tickets are not allowed for go-show. All applicable fees (including fuel and insurance surcharges) and Mabuhay Miles processing fees (including but not limited to rush processing fees and ticketing service charge) and government-imposed taxes (Philippine travel tax and VAT) shall be shouldered by the member/passenger. Miles are not allowed for redeposit, but taxes may be refunded. Taxes and surcharges of the totally unused GMMG award tickets may be refunded following the normal refund procedures and shall be subject to a refund service fee. No-show and Non-User's Fee shall apply if booking is not cancelled at least 4 hours (Domestic) and 24 hours (International) prior to departure to flight departure. GMMG award tickets must be rebooked and revalidated/reissued at least on the last of the sales/ticketing period. International - USD75.00 per sector. GMMG award tickets do not earn Miles and do not count towards elite-tier qualification. 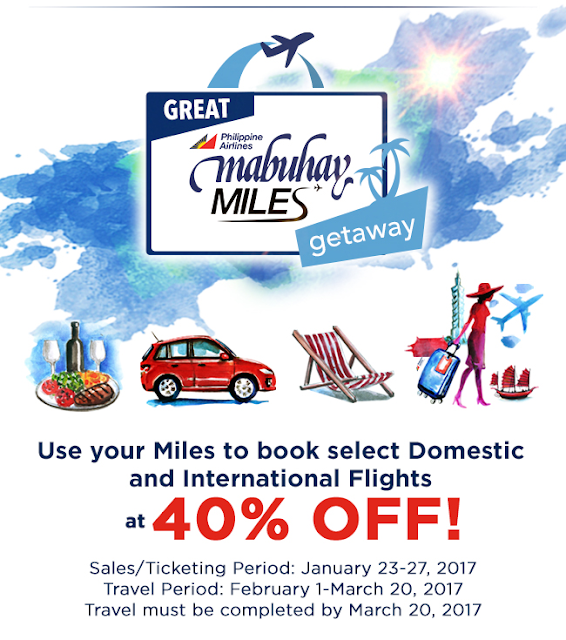 Subject to the full terms and conditions of Mabuhay Miles.